For Immediate Release: Posted On 10/15/2008 By Industrial Magnetics, Inc.
Now you can use one lifter for both horizontal and vertical sheet handling, reduce employee injury by eliminating the improper use of slings or chains to lift sheet metal vertically and increase production time. The Vertical Lift Adapter(VLA) combined with an IMI PowerLift™ magnet, lifts ferrous metal sheets, plates and rounds from horizontal to vertical orientation or vise versa. The VLA is ideal for loading steel plate into vertical storage racks and for lifting plate steel from vertical storage racks to machining centers or cutting tables. 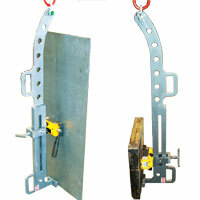 The Vertical Lift Adapter requires no electricity and allows the operator to lift loads up to 4 feet wide. The Vertical Lift Adapter also has convenient, built-in forklift brackets to move and handle steel in a horizontal orientation. The Vertical Lift Adapter is currently available for use with the PNL660 and PNL1300.